Shanghai, a heady fusion of East and West, is still the port of call for a fast-paced adventure. The literal translation may sound banal — Shanghai means on the sea — but China’s booming port city is anything but ordinary. Put that down in part to the legacy of the 19th-century Opium Wars, which handed control over certain sections of the city to foreign powers: the British, Americans, French and Japanese. That mélange of influences gave rise to a dizzying East-meets-West fusion that is evident even today. Shanghai’s cosmopolitan and colorful past can still be seen in the city’s architecture, art and after-dark antics, as well as in its can-do attitude and swaggering success. This pearl of the Orient is shimmering again, having reinstated its position as the eastern metropolis of extravagance. Whether you’re seeking to experience waves of nostalgia for a bygone era or discover the future, this is a city of answers. Along the historic Bund boardwalk on a sweeping bend of the Huangpu River you'll find the old trading houses, banks and customs buildings, now converted into hotels, restaurants and retail emporiums. In the early morning, locals, expats and tourists alike can be seen jogging, practicing tai chi and people-watching. In the heart of the French Concession neighborhood, with its leafy boulevards and elegant colonial homes, is Fuxing Park. Come at dawn to catch a glimpse of residents as they to go about their morning routines — from en masse ballroom dancing to spontaneous renditions of Chinese opera. In November, Shanghai will be better known as a center of Art Deco when it hosts the biennial World Congress on Art Deco. Until then, visitors can get a taster with the Shanghai Art Deco association, which runs talks and walking tours throughout the year. There are a number of excellent jazz venues across town: JZ Club in the French Concession showcases bebop and Latin, around the corner is the smoky Cotton Club, and the House of Blues and Jazz offers classic New Orleans sounds. The Shanghai Museum on People’s Square is a trove of Chinese antiquities, and its shop is a perfect place to pick up postcards, repro souvenirs and art books. Cobbled Xintiandi Plaza offers fashion, fine dining and entertainment, all nestled within traditional Chinese stone architecture. Pop into the playful concept store Shanghai Tang, which has an on-site café; Y+ Yoga Center, which also sells fashion accessories and sportswear; and the holistic Chuan Spa. The International Artists Factory is a collective of designers’ workshops and boutiques. At Harvest Studio, Miao women in traditional costume embroider cushions, tie-dye skirts and leather belts. With an exceptional setting on the edge of Xiangyang Park, Xin Dau Ji restaurant offers al fresco dining under the shade of trees, serving classic Cantonese dishes like glistening suckling pig. Peerless Din Tai Fung is best-known for its traditional dumplings, including the unmissable Shanghai specialty xiaolong bao — tiny, magical broth-filled parcels of pork. City favorite Crystal Jade in Xintiandi is a showcase of Chinese cooking, including fresh noodles, crispy pork belly and Hong Kong dim sum. The landmark 270-room Fairmont Peace Hotel on the Bund has brilliantly preserved Art Deco architectural elements and boasts a glamorous guest list dating back nearly a century. Another throwback, the Yangtze Boutique Shanghai, built in 1934, was in its heyday renowned for its foreign jazz band, sprung dance floor and crooning divas. Today, this 96-room Art Deco gem may be more restrained but it’s still alluring, with a prime central location on Renmin Square. A more petite property is No.9, tucked away down a little lane. This renovated period house has five rooms decorated with antique and Art Deco furnishings. 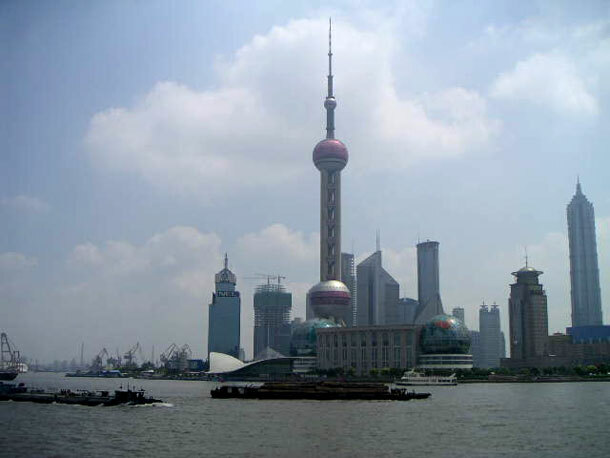 What is now the fizzing financial district of Pudong was, until the 1980s, mostly farmland. Today the area is home to China’s most photographed skyscrapers and some of the world’s tallest buildings, including the Jin Mao Tower and Shanghai World Financial Center. Travelers can come to Pudong directly from the international airport on the Shanghai Maglev train, which reaches speeds of up to 430 kilometers per hour. The M50 art district, located in a clutch of disused warehouses on Moganshan Road, is the nerve center of the city’s contemporary art scene. There are dozens of galleries, studios and cafes, but the most revered space is ShanghART, run by pioneering collector Lorenz Helbling, who has some heavyweight Chinese artists on his books as well as emerging raw talent. “ERA — Intersection of Time” is Shanghai’s most extreme acrobatics show, bringing together traditional arts and cutting-edge special effects. The plot follows China’s epic history, highlighting inventions and discoveries through the centuries. There are more than a dozen acts every night at Shanghai Circus World, including human pyramids and ultimate trapeze. The Royal Asiatic Society hosts open events throughout the year, from book launches to art exhibitions, and offers a friendly forum for cultural exchange. Meticulously beautified by an Italian architecture firm, the waterfront Bund18 houses some of the city’s most elegant stores selling jewelry, from jade to pearls, as well as fine art and antiques. There’s an outpost of Hakkasan, by the inimitable Alan Yau, as well as M18 nightclub. Tell a taxi driver “Taikang Lu” (also known as Tianzifang), and you’ll find yourself in a hub of galleries, ateliers and boutiques. La Vie sells drawstring pants lined with bamboo-patterned silk, T-shirts boldly embroidered with bug-eye fish and ragged wrap skirts stitched with silk. For men, there are modern takes on Mao jackets as well as fisherman’s pants in light cottons. For smart Shanghainese dining, Yuan Yuan touts fresh seafood in slick surrounds. Recently opened Bistro 321 le Bec serves flawless French food in simple rustic surrounds, from duck paté with pistachios to chicken paté en croûte seasoned with five spices, courtesy of Michelin-starred chef Nicolas le Bec. For more established French fare, Jean Georges at Three on the Bund offers Monsieur Vongerichten’s signature flare for the surprising and stunning views of the Bund. On the same strip, M on the Bund is a longtime favorite serving Mediterranean fare; downstairs the opulent Glamour Bar hosts cabaret, film screenings and literary discussions. The M stands for Michelle Garnaut, an Australian restaurateur who founded Shanghai’s International Literary Festival. One of the world’s highest hotels, the 174-room Park Hyatt Shanghai occupies floors 79 to 93 of the Shanghai World Financial Center. On the 85th floor is the Water’s Edge spa and further up, the 100 Century Avenue restaurant. Back on ground level, URBN Hotel Shanghai is an open-plan 26-room hotel in a converted factory warehouse, which uses reclaimed slate, brick and hardwoods in its furnishings. Overlooking Jing’an Park, the 229-room PuLi Hotel and Spa offers some respite from the metropolitan mayhem with its outdoor garden terrace and tea-themed treatments at the Anantara Spa.